What is marvellous about gardening is that one is always discovering new things. Last weekend I spotted this pretty Leptospermum, flowering its socks off by the war memorial in St Ives, Cornwall. The fine foliage and delicate blossoms were a welcome sight beneath the leaden sky. The flowers of L. scoparium ‘Coral Candy’ are double, pink and heavily blushed at the edges, creating the illusion of tender cherry-blossom. Leptospermums form woody bushes like rosemary and look as if they could be Mediterranean natives. Their origins, however, lie thousands of miles across the world in New Zealand and Australia where they flourish on poor, dry soils. Although my brushes with Leptospermum are sadly limited to florists’ shops, this much I knew already. What I hadn’t twigged is that I know this aromatic shrub by two other names. The first is mānuka, quickly confirming it as the main nectar source for the fashionable, miraculous honey of the same name. Mānuka honey is believed to have antibacterial properties, although scientists appear less convinced. Toothsome and expensive it has been recommended to me as a treatment for ailments as varied as the common cold, tonsilitis and mouth ulcers. Whether it works or not I couldn’t say, but it tastes better than any other medicine I know, with the exception of malt whiskey. A Maori word, mānuka can be translated as tea tree, revealing L. scoparium‘s most recognised epithet. When Captain Cook reached the islands of New Zealand in 1769 he is believed to have used the bush to make a Vitamin C-rich infusion for his crew. 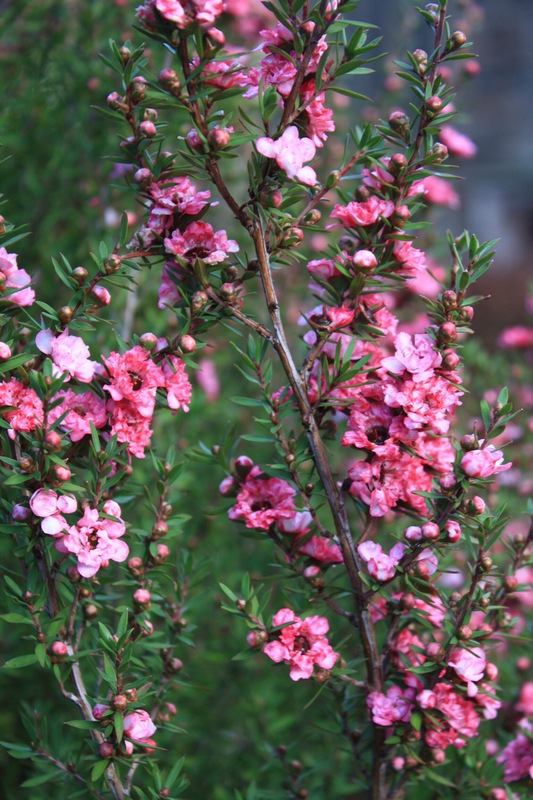 Leptospermum is not to be confused with the plant from which tea tree oil is extracted, which is another member of the myrtle family, Melaleuca alternifolia. So, far from being just a florist’s filler flower (which is prone to dropping all its needle-like leaves in a heated room), Leptospermum scoparium is a bit of a multi-tasker. In the UK, named varieties are hardy in mild areas and are available in white and shades of pink and red. L. ‘Burgundy Queen’ bears especially ravishing double red flowers that would look great as a backdrop to late flowering tulips. For bridal white blooms another double, L. ‘Wiri Linda’, looks like a good choice. These and L.‘Coral Candy’ are available from Burncoose Nurseries. As well as gracing your spring garden, a collection of these pretty shrubs could be the foundation for a lucrative honey empire!